U.S. Marines Arrive In Nepal To Aid Earthquake Victims : The Two-Way Western countries complained that Nepal's bureaucracy was keeping goods at warehouses. The Marines come with Osprey tilt-rotor aircraft, which should make reaching remote areas easier. 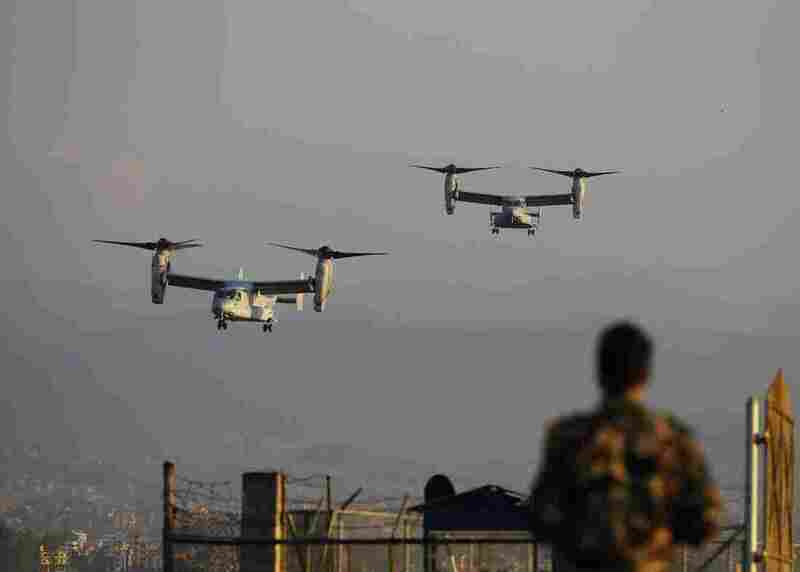 U.S. Osprey tilt-rotor aircraft arrive Sunday at the Tribhuvan International airport in Kathmandu, Nepal. Runway damage had forced Nepali authorities to close the main airport to large aircraft delivering aid to millions of people following the massive earthquake. United States Marines have arrived in Nepal, where a 7.8 magnitude earthquake late last month killed more than 7,000 people. Reporting from Katmandu, NPR's Julie McCarthy says that Brig. Gen. Paul Kennedy, the commanding general of the III Marine Expeditionary Brigade stationed in Okinawa, Japan, tells her the Marines came with four Osprey tilt-rotor aircraft that should make it much easier to reach remote areas. At this point, Kennedy said, the rescue phase of the operation is coming to an end so this mission will be mostly about providing aide. "Probably the most pressing need is shelter," he said. "We're going to start pushing these shelters out to the most remote areas, so people can get under cover before these monsoons kick in in about six weeks." Meanwhile, Western nations have been complaining that aid has been slow to reach victims of the quake because of government bureaucracy. "The United States ambassador to Nepal, Peter W. Bodde, said he had spoken to Nepal's prime minister, Sushil Koirala, about the issue and 'he assured me that all the red tape will be stopped.' "
Kennedy told Julie that the U.S. was only worried about being ready to deploy the minute they were invited in by the Nepali government. "We don't want to bull our way in just because we're ready, they may not be ready to receive us. So we want to make sure that we maintain the relationships that have been forged over the years. And that when they call, that our response isn't slow because we were not ready. We don't feel as though we came late to this party," Kennedy said. "We feel as though when they asked for us to come and they were ready to receive us, that we were on the spot."